Australian opal can be found in several states. Discover the magic of colourful gemstones found in the Australian Outback. Did you know that Australia's opals make up approximately 95 % of the world's resources? Yes, Australia is a classical opal country. It is no surprise that in 1994 this precious stone declared to be Australia's national gemstone. 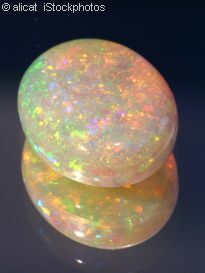 Look at an opal stone from different angles - it changes it colours. The beauty of opals, the play of colours, has fascinated people for centuries. Do you have questions about Australian opal? What is opal? How does it form? 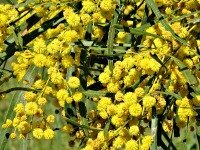 Where is it found in the Australian Outback? 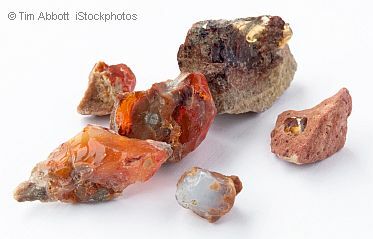 What are the different types of these gemstones? What are doublets and triplets? Find the answers right here! Usually, I don't care much about jewellery, however, opals are really fascinating. They are an unique Australian souvenir. In simple terms, opal is a mix of silica and water. Scientifically, opal is amorphous silica (SiO2.nH2O) which is solidified from liquid silica. As you can imagine, the synthesis of opal was an ancient process. The building process started about 15 - 30 million years ago. Silica gel seeped through sedimentary layers until it was stopped by a clay level. Australian opal therefore is called sedimentary mineraloid. Over million of years, the liquid Silica gel hardened to form the opal deposit of the artesian basin, the ancient underground water reservoir of the eastern Outback. Australia's precious opals contain around 5 -6 % water. precious opal - valuable gemstones with the characteristic play of colours. common opal or potch - that is one-coloured opal. Precious or solid opal has the most value, as the name says. It is the amazing play of colours we all love. The colours of the spectrum displayed in these beautiful stones result from interference and diffraction of light when it passes the silicea spheres in the opal's structure. It can have all the colours of the rainbow. Precious opal comes in different types. It can be white, crystal, black, or boulder opal. Only about 0.25 % of opals mined in Australia are considered precious opal. However, 95 % of the world's precious opal is found in Australia! It is not easy to make a fortune in the opal fields, but some people do. It is definitely hard work! Common opal and potch has a similar structure than precious opal, but the arrangement of the silica spheres is slightly different. That's why these stones don't have the play of colours. Sometimes the opal layer in a rock is so thin there is no way to cut a solid stone. In this case the layer is glued to a piece of potch or obsidian. This is called a doublet. To protect the doublet a layer of transparent material like quartz is added sometimes. The result is called a triplet. Look at the video to see that it is not easy to turn a piece of raw opal into a gem. Opal is mined in South Australia, Queensland and New South Wales. A trip to the mining fields in whatever state is a wonderful journey into the Australian Outback. 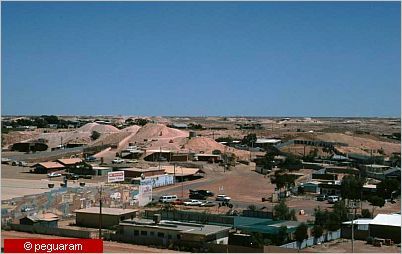 The most famous opal mining towns are Coober Pedy and Andamooka in South Australia. White Cliffs and Lightning Ridge are in New South Wales. The latter is well-known for its black opal. Central Queensland is the home of boulder opal, found in Quilpie, Yowah and Winton. Opal mining towns are unique places to visit. Rough and dusty, with colourful characters. Molehills of stones from the mines and huge machinery are the first signs you'll notice when you approach an opal town. But hey, you'll love them! Despite the rough appearance, you'll find full services in most towns. Some hotels in Coober Pedy even offer the unique experience to sleep underground. And don't forget the opal shops where you can see (and buy) beautiful opal jewellery. When is the best time to visit the opal fields? April to late September is the best time for a trip. Most of these unique towns can be reached by sealed roads, although it is often a fair drive to get there. Summer is usually too hot to enjoy a visit. That's why residents in Coober Pedy and White Cliffs often live in "dugouts" underground. The Australian climate page (in the link section below) gives you an idea about when to visit the Australian Outback.